The forerunners of the Korean people settled a region along the Han River establishing the city of Wiryeseong in 4000 BC. In subsequent Korean dynasties, the city gradually grew in importance with countless forts and walls erected to protect the bustling metropolis. Though time and history would shape the country and the region around it, the settlement would soon be renamed Seoul. To this day, tourist favourites like the Namdaemun and Dongdaemun gates are still around, and it's interesting to know that these fortifications were constructed way back in dynastic Korea, though much of the former walls have since been demolished in favour of city development. As Seoul progressed, modern highways and skyscrapers began to supplant these old historical structures. As a result of this hasty and haphazard approach to urbanisation, one can see many aspects of the past city still making a physical presence in the dense urban jungle of Seoul. Apart the aforementioned gates, Seoul hosts a large number of former royal palaces; in addition to what's left of the Seoul City Wall. Many infrastructural projects of the Joseon dynasty also remain though many have been replaced by more modern thoroughfares. That being said though, an aerial view of the city would reveal that much of the city's new infrastructure has been influenced by the planning decisions of the past. However, these modern replacements (which are now ageing) have also recently been placed under scrutiny as to how much benefit they actually contribute to Seoul. Accompanying this reassessment of urban Seoul is a growing movement of experts and citizens that are calling for a restoration of Seoul's heritage sites. They also want to see a larger number of public spaces to be constructed and that these have to be open for recreation. Pursuant to this, Seoul is now going through a period of urban renewal at a pace unlike many of its Asian counterparts. We'll take a look at how far they've come. Though the waterway (Cheonggyecheon) has been in existence since time in memoriam, it was always hidden from sight by a highway that cut through the center of Seoul. Before this, Cheonggyecheon was an open sewer for the city’s inhabitants, although it found itself in an accessible part of the city, Cheonggyecheon wasn’t exactly somewhere you’d take someone on a date with. Similarly, the highway that towered over the ground level roads was an eyesore in and of itself. This 3.6 mile long green corridor stretches from City Hall to Dongmyo, connecting many of the city’s treasured landmarks from Deoksugong Palace to Insadong. It ends just before the central boulevard of Sejong-daero, which leads to Gyeongbokgung Palace - the most iconic palace on the Korean Peninsula. It’s a veritable tourist attraction of its own. As a result of an immense urban renewal effort, the aforementioned highway was demolished in favour of developing the waterway (it was always clogged with traffic and hence inadequate). The result of this effort, the Cheonggyecheon Stream, is now an exemplar for urban renewal projects, once again reinjecting life back into downtown Seoul. In order to supplement the congestion issues that arose from the removal of the highway, Seoul city authorities along with the Korean National Government invested considerable sums in augmenting the public transport system (new train lines) whilst creating dedicated bus lines all across the city. Furthermore, as it was clear that the removal of the highway would improve pedestrian flow throughout the area, urban planners also re-designated the nearby Gwanghwamun Square to be a pedestrian friendly thoroughfare. From an ecological perspective, a green artery running through the city saves urbanites from the urban heat island effect. Currently, the walkways around the stream are about 10% cooler than adjacent blocks whereas in the past, the stream was consistently warmer than the average for Seoul. Reducing the overall air pollution from cars in the city centre is also an added benefit, as is the increased efficiency and viability of the public transport network. Forward thinking flood protection in anticipation of high volumes of rainfall, calculated to occur (on average) once every 200 years, was also achieved. Though this was not the primary concern at the start of construction, the issue of flood protection started to gain importance after concerns over climate change mounted. This affected the structural makeup of the stream and also other heritage and restoration efforts - the stream is after all, a relic that has predated many things in the city. The completion of the Cheonggyecheon also increased public's appreciation of such projects - the recognised economic value of having the natural stream has increased (polls were taken) from 20,226 KRW to 37,724 KRW. The project came at a time when Korea was ready to emerge onto the world stage - its K Wave phenomena spreading across the globe at the same time when onlookers were treated to the dazzling completion of the Cheonggyecheon. As a sister project to the restoration of the Cheonggyecheon, Seoul 7017 was conceived with similar intentions and is akin to an elevated linear park like New York’s High Line. 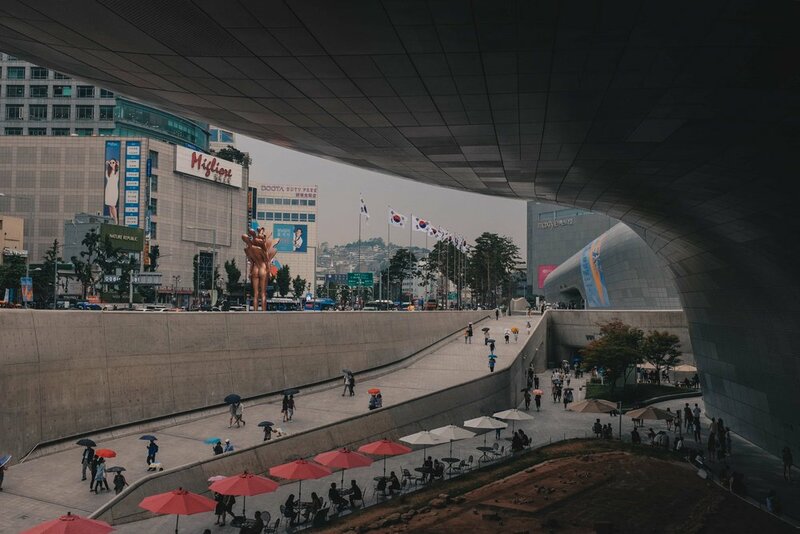 Named after the year the overpass was built (1970) and the year it was completed, 2017, Seoul 7017 is a public space that injects a convivial atmosphere to one of the busiest metropolises in Asia. In some respects, as Asian capitals have been lagging behind major European capitals in the realm of urbanism and city walkability, Seoullo 7017 is an important step forward. Indeed, most Asian cities in the pursuit of growth and development have carved up or relocated green spaces to areas underneath highway overpasses or to the peripheries of their city borders. With a global shift towards embracing liveability and prioritising the beauty of built up spaces, cities like Copenhagen and Barcelona have deliberately reoriented their views of what their city should feel like. First and foremost on this new agenda of enhancing the city is the effort to revitalise neglected infrastructure. During the 70s, a traffic crunch in the South Korean capital prompted city authorities to construct a variety of highways and overpasses across the city. Despite this boon for motorists, much of the infrastructure fell into disuse or became unignorable eyesores for the public. As a re-imagination of a former highway overpass, Seoullo 7017 cuts through various districts in Seoul and stretches over a kilometre, gliding past the central Seoul Station on its way from Malli-dong to Namdaemun. 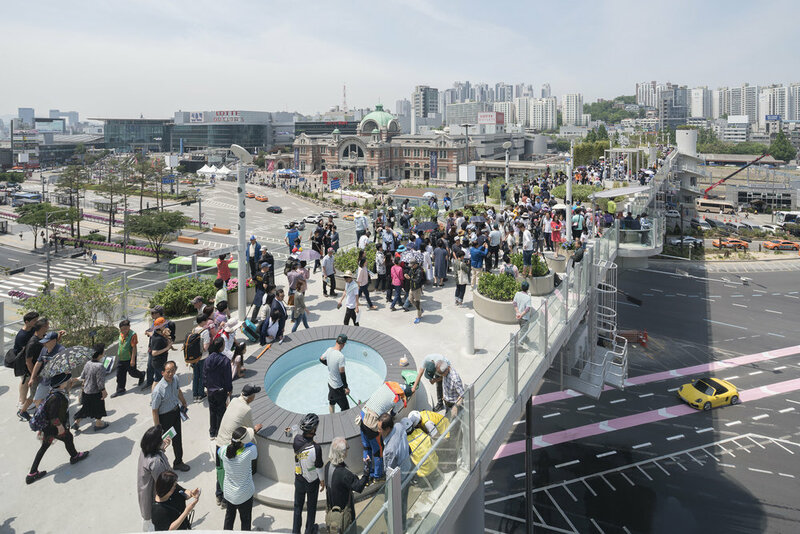 This is a huge project for the area as despite representing the heart of the city, the area around Seoul Station has been a misnomer in the city's developmental story. This was because the area acted as the city's transport node thus quickly becoming choked with rail lines and highways. Unsurprisingly, this congestion reducing the ability of residents and workers to comfortably appreciate the area - for the centerpiece of a country's capital, that's unfortunate to say the least. Where once it was a public eyesore, the new park injects a host of green spaces into downtown Seoul doubling up as a tourist attraction and a means for pedestrians to traverse the urban jungle. Along the way, one can experience a plethora of plant species strategically deployed along the route. There are also frequent art exhibitions held. All along the elevated walkway, one can stop to sample traditional Korean snacks and imaginative interpretations of Korean culture represented as plant displays. Add to this the various seasonal festivals and markets held all along Seoullo 7017 and it'll make for a great beginning experience or denouement for any visit to Seoul. With Seoullo 7017, the Seoul Metropolitan Government aims to overturn traditional Asian approaches to city development; that is, to repudiate growth at all costs in favour of reusing and revitalising existing spaces. This goes hand in hand with an effort to elevate the presence of Korean history and culture in everyday life. As one of the most important districts in Seoul, Dongdaemun is the centrepiece in Korean fashion. And at the heart of the district lies the forward thinking 'metonymic landscape' of Dongdaemun Design Plaza. Before DDP was built, an ageing sports complex (abandoned after the end of the Olympics) stood in its place. However, by 2014, the complex was finally replaced by an edifice with a swooping facade designed by the famed Zaha Hadid. Due to its magnificent design, DDP has become a veritable tourist hotspot, attracting architectural buffs and lay travellers alike. It also serves as the venue for the biannual Seoul Fashion Week with Seoul's well dressed youth descending onto the plaza grounds to show off their interpretation of what trend-obsessed Korean fashion truly is. On off periods, DDP remains as one of the city’s most popular public spaces. Keeping in step with its ambitious vision, DDP aims to be a venue (in some weeks, even more like a convention centre of sorts) for those interested in the power of design. It has multiple exhibition spaces (with exhibitors taking turns to occupy the space), design ‘labs’ and even an outdoor atrium for weekend markets. With this, all of these efforts have a singular aim - to expose and highlight the important of design in everyday life, from well-made lifestyle products to the creative ingenuity that goes into architecture and system design. Its interior is also a spectacle to behold, with Zaha Hadid designing beautiful 'in between spaces' like the undulating staircases and sloping floors that make up the building. It's a real treat to explore the various interconnecting spaces within the building - a sight that can easily rival the broad vistas of the building's outdoor spaces. Securing a spot for an exhibit or even a small store within DDP raises the profile of the designers and companies, exposing them to hyper interested local audiences and curious international visitors. The inauguration of the project back in 2009 was also one of the crucial reasons for Seoul becoming the World Design Capital of 2010. The construction of DDP nevertheless was not without controversy. As Dongdaemun (literally in its name) is one of the locations for the city’s four great gates, many were concerned over how the new neo-futurist building would distract visitors from the heritage of the district. And while there existing a small Dongdaemun History and Culture Park dedicated to the historical importance of Dongdaemun’s Heunginjimun, it inadvertently gets sidelined. Nevertheless, do stop by the park while you’re at DDP - there’s a host of historically valuable archaeological items on display. As Singapore looks to establishing itself as a vibrant world city, there are many lessons it can learn from Seoul. Apart from its smart nation efforts, Singapore would benefit greatly from having high quality public spaces and a overall reassessment of what works - and what doesn't. 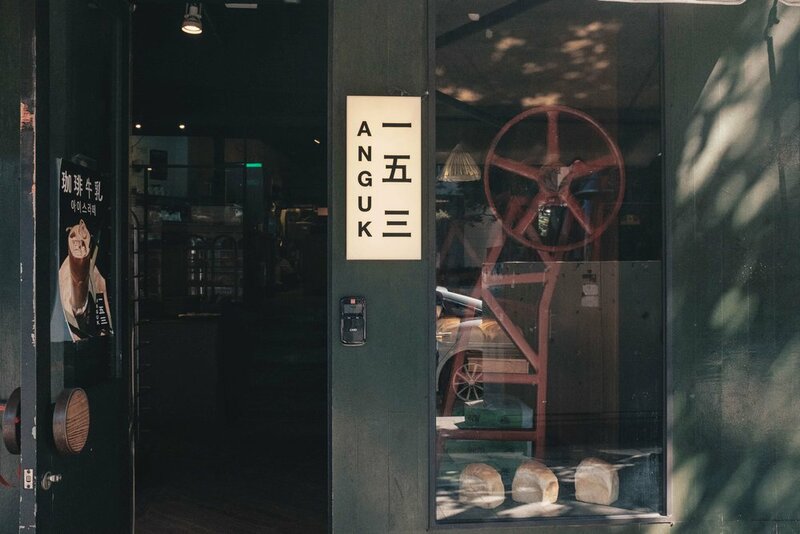 Though it's still early days for Asia's pivot towards urban revitalisation, we're excited for the things to come!